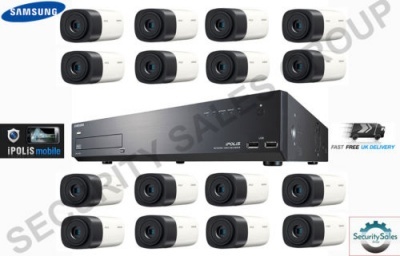 Have peace of mind with this fantastic CCTV Package! This system enables you to view your cameras remotely, wherever you are around the world with the Remote Viewing facilities. The SRN-1670D are high-quality, powerful performance network video recorders that support up to 16 network streams with a throughput of up to 64Mbps. These NVRs feature real-time recording capability at 4CIF (704 x 480) / 1.3M (1280 x 1024) / 2M (1920 x 1080) / 3M (2048 x 1536). They also offer compression in different formats such as H.264, MPEG-4 and MJPEG in dual codec, which allows selecting the proper codec to meet the users' needs. For storage, the NVRs support up to 5/1 SATA HDDs with possible expansion and a USB and DVD writer for easy backup. . The SNB-6003 is a camera from Samsung Techwin WiseNetIII network ranges which feature the most advanced functions from Samsung with 2 megapixel 1080p of high definition images. Its high functionalities includes 100dB WDR which delivers 30fps at 2 megapixel 1080p, low light performance down to 0.1 lux (F1.2, 50IRE, color) creating clear images under low light conditions, and P-iris support which result in images with better contrast, clarity, resolution and depth of field. With enhanced features and new technologies which combat the challenges of though environmental conditions, the SNB-6003 will meet the market need which requires professional security.